New pipelines aid “Earthquake Country” of Fremont, Calif.
Two major water transmission lines, Bay Division Pipelines Nos. 3 & 4 (BDPL3&4), serve 2.6 million people in four Bay Area counties. These lines cross over three major traces of the Hayward Earthquake Fault in a residential area and next to a major freeway in Fremont, Calif. Built in 1952 and 1973, BDPL3&4 are part of the San Francisco Public Utilities Commission’s (SFPUC) Hetch Hetchy Regional Water System. At 6.5 and 8 feet in diameter, the pipelines cross over the Hayward Fault, which, according to records from the United States Geological Survey, has experienced an earthquake every 140 years. The last big earthquake at the fault occurred in 1868, which means the next big one could happen at any time. Geological experts anticipate that BDPL3&4 could experience as much as one foot of extension and nine feet of contraction as a result of an earthquake on the Hayward Fault. The SFPUC turned to cutting-edge seismic technology to protect these critical water lifelines. In 2007, the SFPUC installed two shut-off stations on opposite sides of the three earthquake traces beneath BDPL3&4 to prevent potential flooding in the event of a pipeline break. 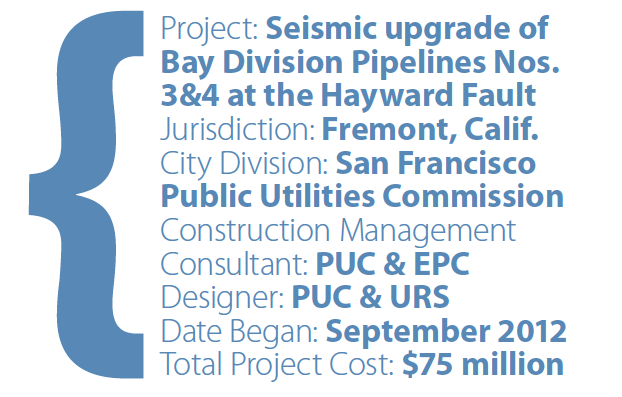 In 2012, the SFPUC began the seismic retrofit of the pipelines. First, crews constructed a wall of interlocking secant piles on either side of BDPL3 where it crosses the most active traces of the Hayward Fault. Second, they rebuilt a segment of BDPL3 within an articulated box made of free-moving concrete segments, which will be able to move individually to absorb earth movement. Third, crews fit this pipeline with a specially designed 77-ton slip joint, along with two huge ball joints at both ends. The articulated box, the slip joint and the ball joints together allow the pipe to compress, move, and even rotate without rupturing. BDPL4 has been strengthened and retrofitted in such a way as to safely rupture during an earthquake to prevent flooding in surrounding neighborhoods. 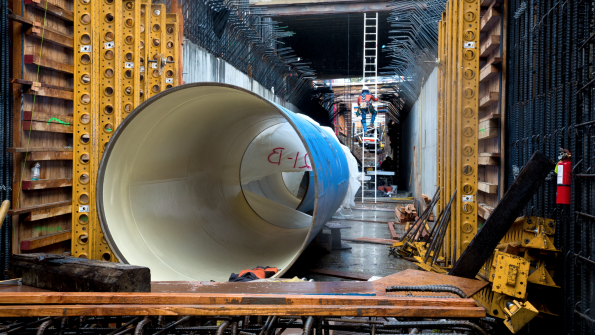 The seismic retrofitting of BDPL3&4 is part of the $4.6 billion Water System Improvement Program to retrofit, repair and replace the Hetch Hetchy Regional Water System’s aging pipelines, dams and tunnels. The seismic goal of the WSIP is to provide minimum system demand to customers within 24 hours after a major earthquake. Construction on BDPL3&4 will be completed in 2015.